Earlier this year, I had the pleasure to do two hands-on sessions at the ATD TechKnowledge conference in Las Vegas, NV. The point I was trying to drive home was to use Game Thinking while designing a course or assessment to make it engaging. Game Thinking forces us to design actions, core dynamics that the user/player does, rather than focusing on how to PRESENT content. The other important concept the sessions promoted is the adaption of the Minimal Viable Product (MVP) approach when designing elearning. To learn more about lean startup, game thinking and building your MVP in product development, one of the best resources to check out is Amy Jo Kim. This simple case study is about one of the examples I used at the session. You decide if you want to read about the how below, or you want to jump in first and try it! Let’s assume that your “content” is the steps of a win-win negotiation strategy. In your curriculum, participants learn about the order of the steps and the important actions that happen with those steps. Let’s assume that you have a classroom training that runs this successful exercise, where two “CEOs” are hiring the best talents for their teams in the room by negotiating. There’s a time limit, budget and specific roles. Each “talent” has a specific job they are applying for. The goal of the two CEOs to fill their open positions by the end of the role play. The goal of the talents is to maximize their salary (+ bonus), at the same time, they should not stay “unemployed” by the end. Now, this works well in a classroom. This works well in the classroom. The challenge is to replicate this online, in an elearning, where there’s no other people to negotiate with. One common mistake when moving from ILT (instructor-led training) to elearning is that we’re trying to duplicate the learning experience. My suggestions is to analyze the ILT version and come up with the following buckets: what to keep, what to change, what to add and what to remove to maximize effectiveness. If you’re not building on the strength of the delivery platform (elearning, mobile, etc. ), you most likely end up with a mediocre replica. Game Thinking focuses on the EXPERIENCE, not the tools, technology or game mechanics. It’s about the EXPERIENCE that directly relates to learning and performance. Going through the original ILT exercise, the experience for the CEOs was clear: applying the steps of negotiation over and over again. That’s a keeper. They did this under time pressure and limited budget. These factors must stay in the online version as well. Now, if you look at the talent pool, they did not drive the negotiation. They were on the receiving end. So, only two people were exposed to thinking through and driving those steps. This can change in the online version. Everyone should play the CEO’s role, to go through those steps in order, as many times as possible. In the ILT version, the talents could come up with whatever background they wanted. Some of them were “harder” negotiators, others were easier. This whole piece is missing online. There are no other people, so we need to add something that could simulate that. Every gameful experience has some core dynamic actions that users/players do over and over again. The core dynamics can make or break the experience. Is it engaging enough to motive users to interact? Simple enough not to frustrate? Challenging enough to keep them engaged? Do they reinforce learning and drive performance? You need to hire three types of people. Department Head, Team Lead and Team Member. Their minimum salary will be different. More to come on that. You have an operating budget (5,000) and some bonus budget (200). You are the CEO of the blue team. Progress is indicated above. However, it’s not just about hiring the number of people, it’s about quality of those new hires. 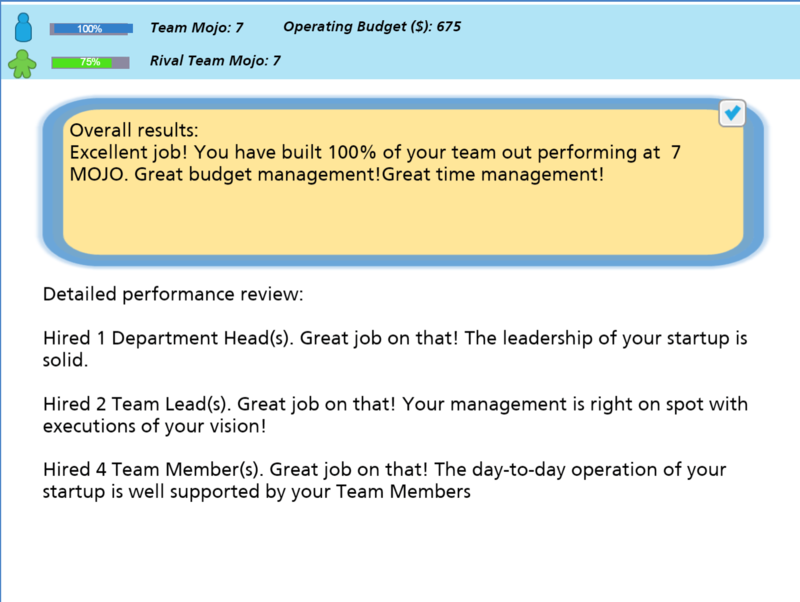 Quality/Performance is measured by Mojo. There’s a timer running to keep you going. 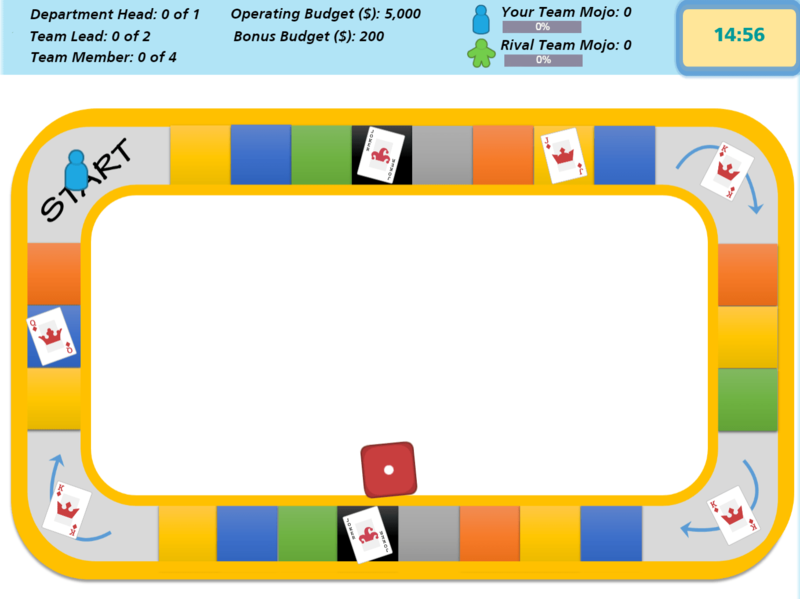 The board and the dice are new additions to the original ILT version. Why would we include them? In the original version, the “hiring” role play was going on simultaneously. In the online version, we have turns. 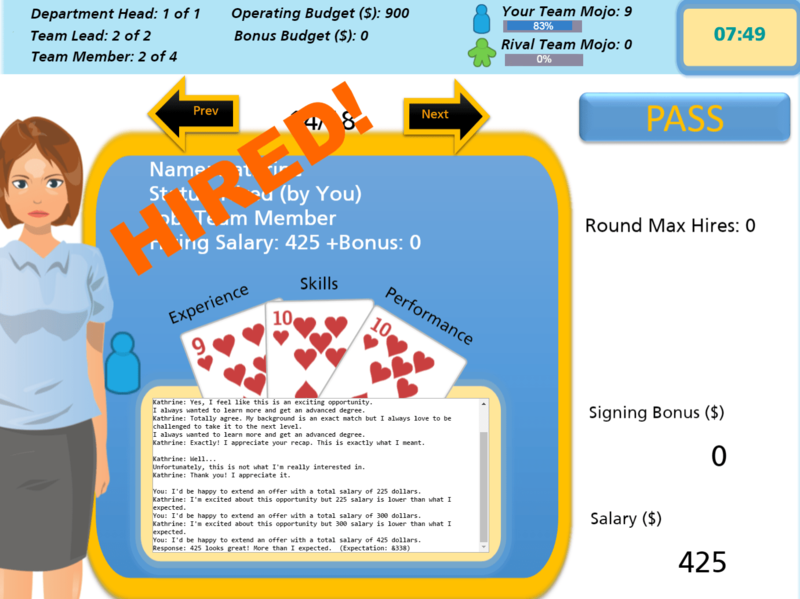 In each turn, you can hire a set number of candidates. After turn is over, the opponent startup “hires” from the same talent pool. The board shows the progress inbetween turns. It also provides an opportunity to introduce some game mechanics. The dice (using physics) allows us to include some randomness. 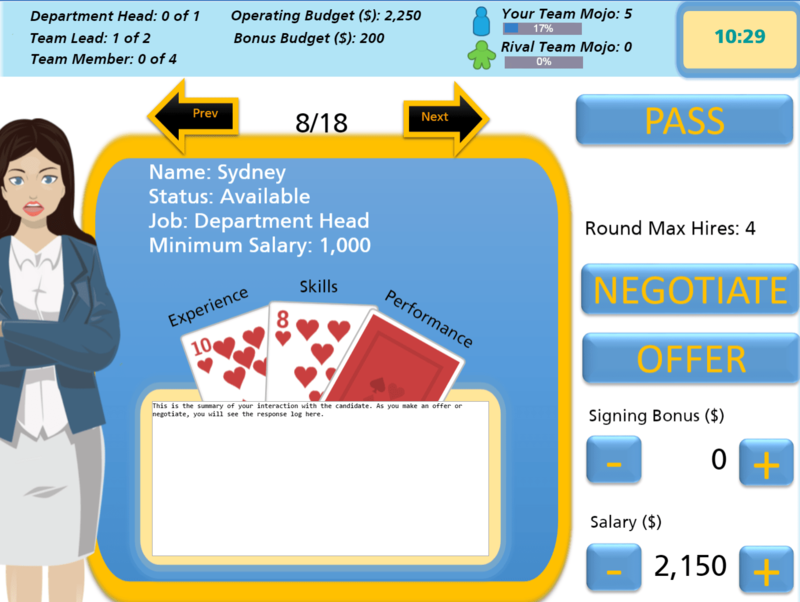 Colors on the board represent different maximum number of max talents that you can hire in one turn. Landing on a card (luck, surprise and delight) gets you some extra bonus. These elements do not affect the outcome too much, at the same time, they provide variety. And it’s fun to throw the dice. 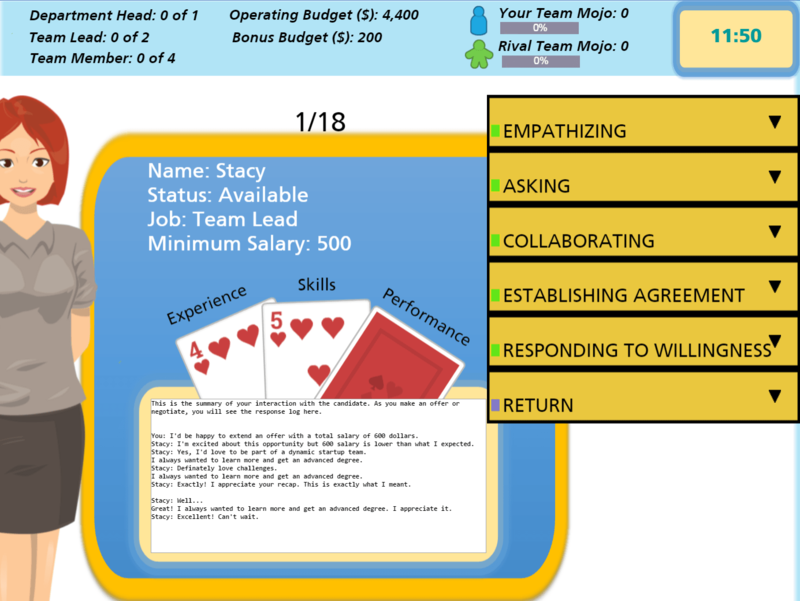 During your turn, you interact with the core dynamics: you negotiate and hire team members. There’s a talent pool to choose from. 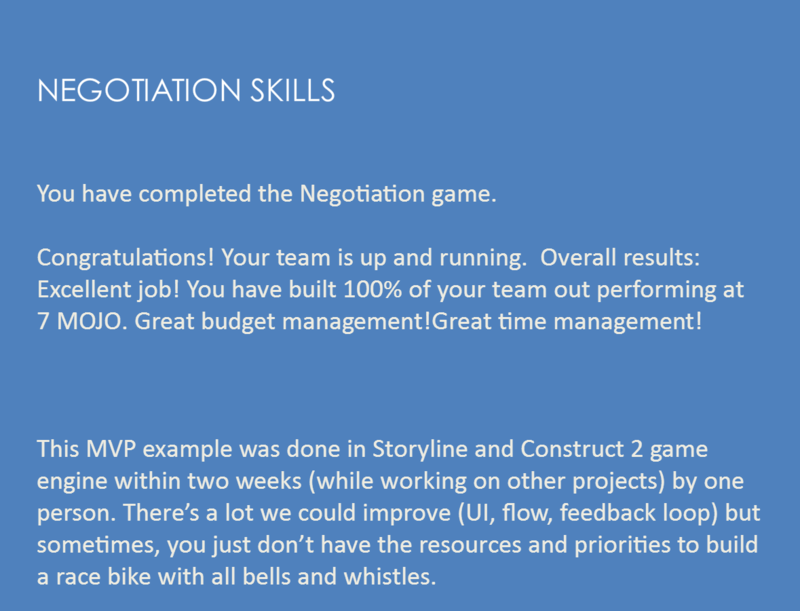 The game engine (Construct 2) allowed us to introduce some “artificial intelligence” to simulate negotiation. 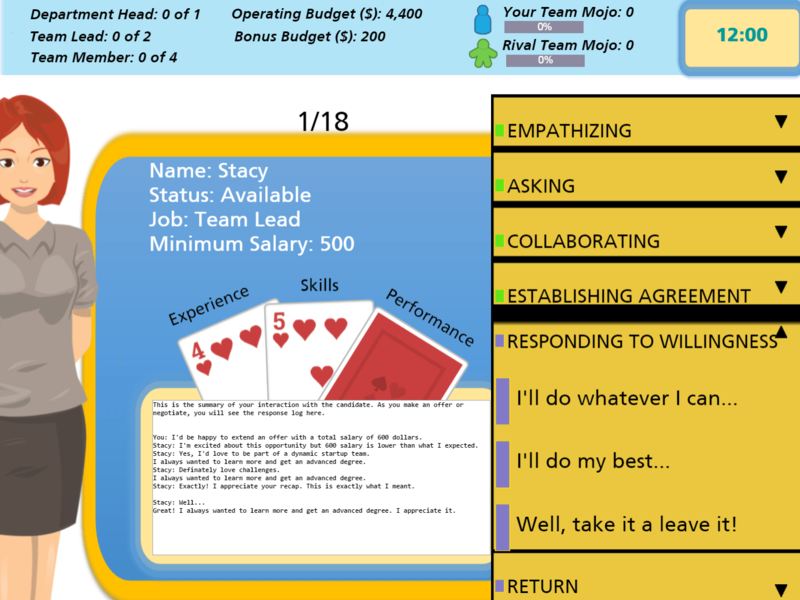 Each character has attributes (somewhat randomly decided at each run) that determine their bottom line of negotiation, salary request, attitude towards low balls, willingness to compromise, etc. Also, each character has three key numbers: Experience, Skills and Performance. The average of these three makes up the Mojo. The higher the mojo the better. However, while you’re negotiating, you do not see Performance (mystery). Just like in real life, you have resume and skills on paper but you don’t know the performance until you hire someone. Again, this is new in the online version. You may decide your strategy. Do you just throw numbers as offers? Or negotiate? You can’t negotiate with everyone. There’s probably not enough time. But you can’t give everyone a high figure either, because you run out of money. During negotiation, the steps are displayed in an accordion. You choose the strategy within a step but you must go in order. The talent’s reaction is captured in the conversation. You must pay attention to what the talent says in order to maximize the power of negotiation. Within a step, you may choose any of the actions. This process is less about the exact words and scripting, rather than the steps and the order of steps you go over and over. The conversation is simplified to the point to drive home what the course was about: reinforcing the negotiation steps. A successful negotiation reduces the asking salary of the candidate. For this prototype, we included Expectation sometimes to see how it changes during the conversation. While hiring, you must pay attention to the time, budget and the candidate’s mojo (including guessing the performance card). Also, keep in mind that your opponent is hiring from the same talent pool! If you do not hire someone, they might. The candidates also have a “sense of time.” As the game progresses, just like in real life, they might be more willing to negotiate or lower their expectations because nobody wants to stay unemployed. At the end, you get a personalized summary of how you did. Is this the most polished product ever? No. If we had time and resources, we could take that from this state and reskin… But sometimes you don’t need a race bike with all the bells and whistles. Is it engaging enough to motive you to view and use the negotiation steps over and over again? (And ultimately, on the job…) You decide here! ← Is Instructional Design Dead? Another great Zpost – I enjoy the creativity of your efforts. Can you break down your time investment across: requirements, conceptual design, game design, development and testing. What are you using for your graphics? Thanks. Thanks, Dave! As I mentioned in the post, this was created under very tight resource restrictions. The face-to-face version of the exercise was already created, so analysis and requirements were quick. There wasn’t a formal storyboard created. The first prototype took about 3 days to design and create in Construct 2. Another 4-5 days were the iterative process of playtesting and tweaking. It took about 2 days to find the balance between time, budget, bonus and the amount of negotiations the player has to do. Originally, we had more people to hire. The graphics are from eLearning Brothers and PowerPoint. Also, in our final version we also give credit to some creative people on http://www.opengameart.org. It’s a great resource for games.